THE DOVES PRESS WAS FOUNDED IN 1900 by T. J. Cobden-Sanderson, in partnership with photo-engraver Emery Walker, in Hammersmith, London. During nearly seventeen years of operation, the Doves Press produced some of the finest & most notable examples of twentieth century typography. The distinguishing & most celebrated feature of its books was a specially devised fount of metal type, known variously as the Doves Roman, the Doves Press Fount of Type, or simply the Doves type. When the partnership was formally dissolved in 1909, a settlement was proposed whereby the two men would share the type; T. J. Codben-Sanderson could retain its exclusive use to continue printing Doves Press publications until his death, whereupon ownership would then pass on to the younger man, Emery Walker. Nonetheless, after the Doves Press was closed in 1917, an epitaph appeared in the press’s final publication announcing that Cobden-Sanderson had ‘bequeathed’ the type to the bed of the River Thames. Read more about the fascinating Doves Type history here. 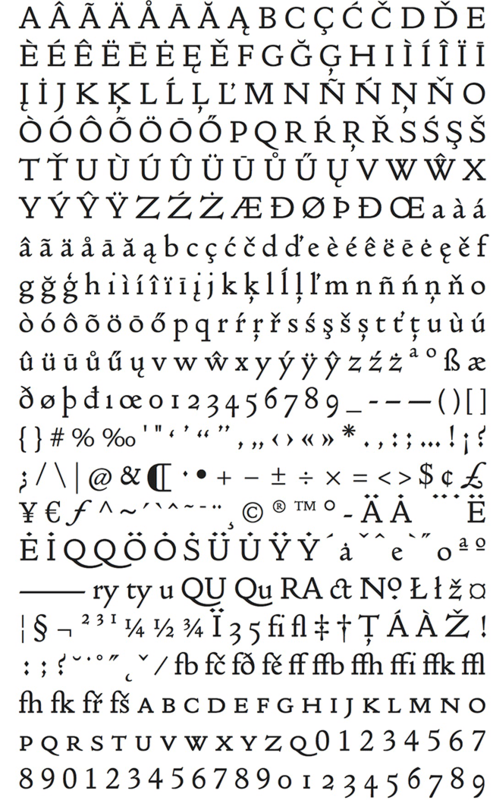 In 2013, after three years of research and drawing, Robert Green released a facsimile font of the lost Doves type through Typespec. However, following the acquisition of a greater range of archive material in 2014, Green began to update his digital version of the typeface. But in order to create a definitive reproduction, he decided that the original metal sorts, now lying on the riverbed, would have to be examined. In November 2014, the Port of London Authority’s diving team, directed by Robert, recovered 151 metal sorts from the Thames. A portion of this type will now be donated to the Emery Walker Trust, where it will be displayed to the general public. In 2016, Green undertook more work to improve the digital font for contemporary usage. This latest release of the updated Doves Type® contains extended glyph coverage including small caps, together with both lining and tabular figures. Tracking and kerning have also been adjusted for 21st century usage. The original Doves Press type, cut for letterpress with its physical constraints and inherent quirks, contains spacing which would appear uncomfortable to modern eyes in web-based and litho applications. The Doves Type® Regular single font comes in OpenType OTF format for Mac & PC desktop use, suitable for print and all high resolution applications. It is also available in web font formats for self hosted websites (up to 10K monthly pageviews on average). Please note that if you require a licence for more than 5 desktop users/devices, or if you’d like to arrange a larger web licence, or a digital embedding licence (apps, eBooks etc) please email us for a quote to cover your needs.